"Sleepy Hollow," a shallow depression in the Mars ground near NASA's Spirit rover, may become an early destination when the rover drives off its lander platform in a week or so. That possible crater and other features delighted engineers and scientists examining pictures from the Mars Exploration Rover Spirit's first look around. "Reality has surpassed fantasy. 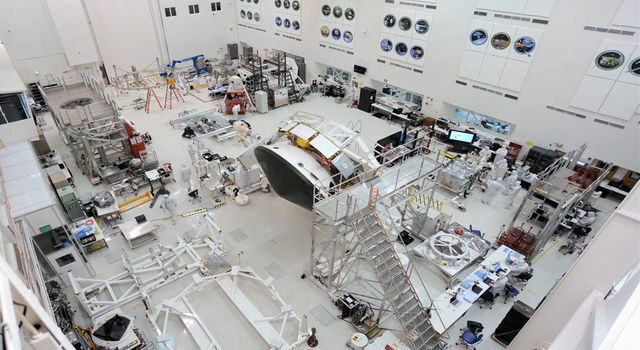 We're like kids in a candy store," said Art Thompson, rover tactical activity lead at NASA's Jet Propulsion Laboratory, Pasadena, Calif. "We can hardly wait until we get off the lander and start doing fun stuff on the surface." A clean bill of health from a checkout of all three science instruments on Spirit's robotic arm fortified scientists' anticipation of beginning to use those tools after the rover gets its six wheels onto the ground. Also, Spirit succeeded Sunday in finding the Sun with its panoramic camera and calculating how to point its main antenna toward Earth by knowing the Sun's position. "Just as the ancient mariners used sextants for 'shooting the Sun,' as they called it, we were successfully able to shoot the Sun with our panorama camera, then use that information to point the antenna," said JPL's Matt Wallace, mission manger. 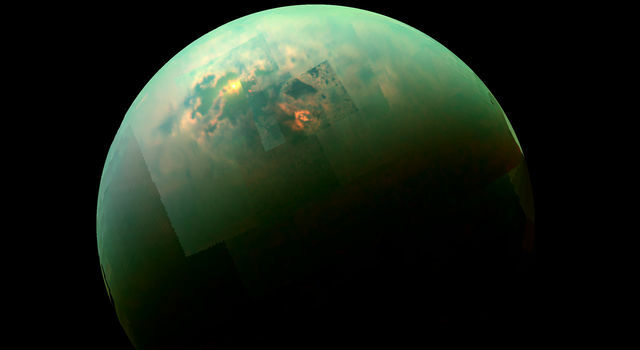 Within sight of Spirit are several wide, shallow bowls that may be impact craters, said Dr. Steve Squyres of Cornell University, Ithaca, New York, principal investigator for the spacecraft's science payload. "It's clear that while we have a generally flat surface, it is pockmarked with these things. The mission's scientists, who are getting little rest as they examine the pictures from Spirit, chose the name "Sleepy Hollow" for one of these circular depressions. 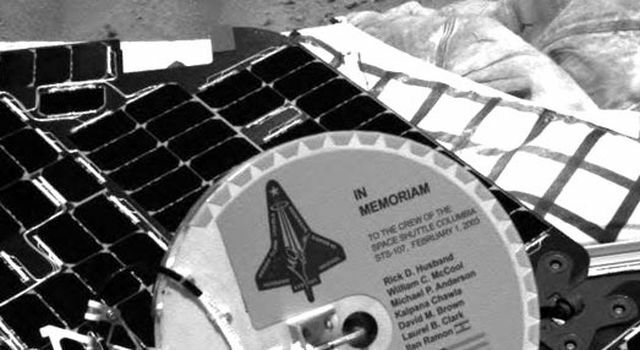 This one is about 9 meters (30 feet) across and about 12 meters (40 feet) north of the lander, Squyres said. "It's a hole in the ground," he said. "It's a window into the interior of Mars." One of the next steps in preparing Spirit for rolling onto the soil is to extend the front wheels, which are tucked in for fitting inside a tight space during the flight from Earth. 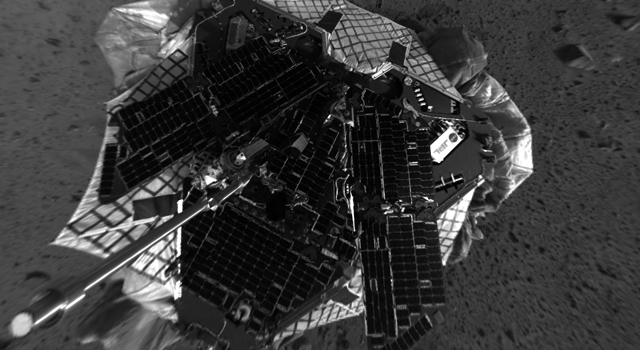 Spirit arrived at Mars Jan. 3 (EST and PST; Jan. 4 Universal Time) after a seven month journey. Its task is to spend the next three months exploring for clues in rocks and soil about whether the past environment at this part of Mars was ever watery and possibly suitable to sustain life. JPL, a division of the California Institute of Technology, manages the Mars Exploration Rover project for NASA's Office of Space Science, Washington. Additional information about the project is available from JPL at http://marsrovers.jpl.nasa.gov and and from Cornell University at http://athena.cornell.edu .